Despite its privileged perch above the city and beach, Miramar is very close to all the excitement and hubbub of Barcelona. It's also quite near the historic center of the city, which radiates out from Plaça de Catalunya. A 15-minute drive brings you to the international airport. A large, scenic hill rises out of the city, where Barcelona meets the beach. Enjoying the incredible skyline and Mediterranean views at the top of that hill are Montjuic Park, a palace, and a gorgeous luxury hotel. Assuming you don't get invited for a sleepover at the palace, your best bet is to drink up that view is with a night or three at Miramar. Classic styles with modern touches are the rule here, with an abundance of contemporary furniture and funky objects d'art. The exterior retains the history of the building, which was built for the 1929 World Fair. A little secret about the rooms: whatever type of accommodation you book, you can ask for a private patio with a Jacuzzi. At Miramar, you're within walking distance of that buzzing hub of Barcelona's famous street scene, Las Ramblas. The Montjuic Gardens are also well worth an afternoon's stroll, and the long stretch of beach just below the hotel is a hotspot for locals and visitors. 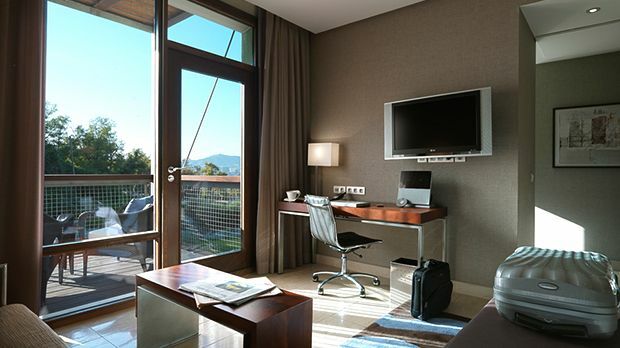 Send an availability request with your requested dates to the Hotel Miramar Barcelona . Deluxe Room with Queen, King or Twin beds (available for this room by request). Also offers garden views. Boasting a large private terrace or balcony with stunning views, these rooms contain Queen beds, a sitting area and stylish bathrooms. Featuring a lavish King bed and elegantly styled bathroom, these suites also offer an impressive private lounge area.